Filson Card Case. 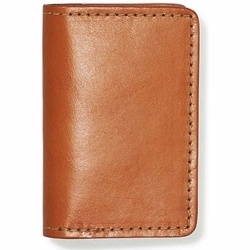 Developed, cut and sewn at Filson in Seattle, WA, this card case features vegetable-tanned Bridle Leather for maximum durability. It has two compartments for multiple credit cards, and two compartments for multiple business cards. Heavy-duty bonded nylon thread stitching ensures integrity and durability, for decades of use. It comes in a reusable, tear-resistant sueded Moleskin drawcord bag.